Unless you’re fortunate enough to have a maid, laundry is a part of your everyday (or maybe every week) routine. 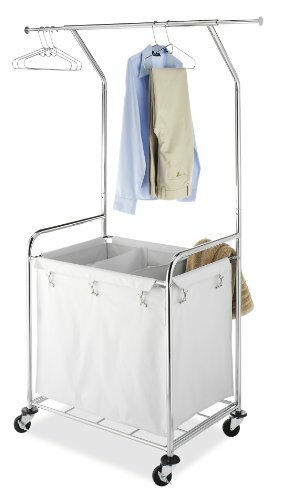 How can I make laundry easier? There are many storage products that you can use to make the process more convenient, so I decided to make a guide to help you streamline your laundry routine. Your laundry travels all around your home. Let’s say that the journey of your clothes starts when you put them on in the morning. You wear them all day, and at night you toss them into a laundry organizer or hamper that you have in the bathroom. The clothes stay there for a few days until they are tossed into a laundry cart with other clothes to travel to the laundry room. The clothes go into the washer where they are cleaned with laundry detergent from the laundry room storage area. The clothes are washed and dried, and then tossed onto a laundry table to be folded. They may even be ironed before they are placed back into the pull-out hamper and taken back to your bedroom where they are stored in a cabinet or armoire until you are ready to wear them again. A lot of storage space was required during that journey. Let’s take a look at some of the useful storage items that you can use in all of these locations. These products we’re looking at in this section aren’t necessarily for storing laundry, but rather adding storage to your laundry room. For example, there might be enough space between your washer and dryer to add a slim rolling cart that you can keep detergents on. Also, you can get stationary or rolling shelves to add a ton of vertical storage to your laundry room or pantry. 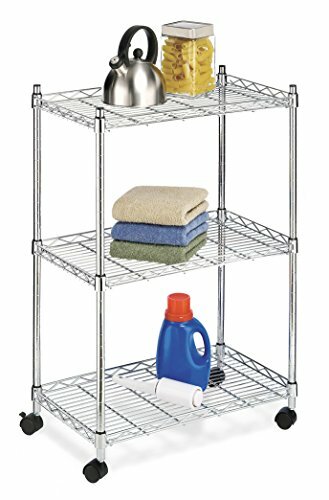 This cart could be used for more than just laundry room storage, but it’s a great size for holding detergent containers and other cleaning supplies. It’s made from steel with a durable epoxy powder coating. There are 3 color options: beige, black, and red. 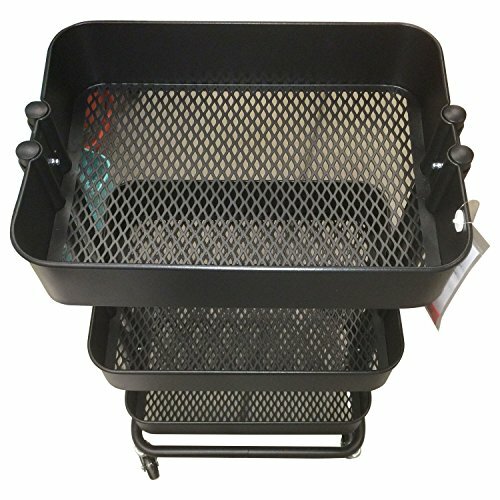 This heavy duty cart could be used to hold gardening tools, cleaning supplies, animal supplies or food, and tons of other things. The Raskog is a great buy with sturdy construction. If you have your washer and dryer side-by-side, then you can store this cart between them. It’s narrow and will help make use of space that was otherwise unusable. That leaves more room for storage on shelves. 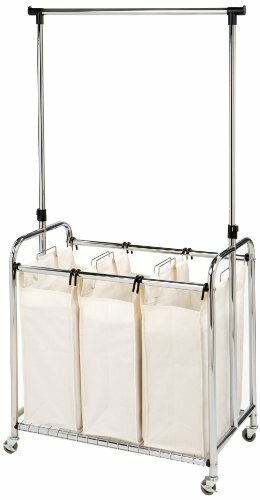 This laundry cart will hold all your detergents, softeners, stain removers, and other laundry supplies. 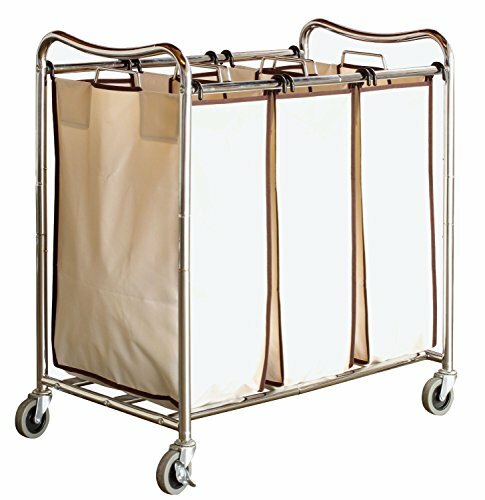 While many might not appreciate plastic as a cart material, this laundry cart seems to be very durable. 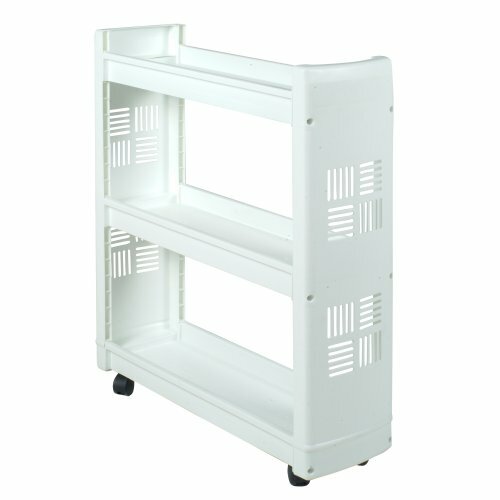 While the Whirlpool 1903WH can carry a lot of weight for a laundry room storage cart, it does feel a bit flimsy toward the top. If you’re planning on loading it up, I suggest packing the lighter laundry room accessories towards the top of the cart. Shelves adjust in 1-inch increments. Durable chromed steel with 250 lbs capacity. Highly adjustable shelving will go up or down in increments of 1 inch. 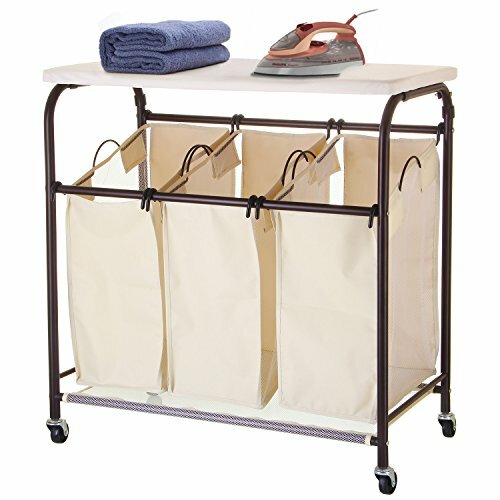 This is another great multi-purpose utility cart that could be used for laundry or cleaning supplies and is at a very affordable price. 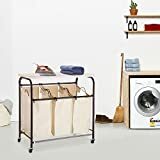 This cart by Whitmor is about 5 inches wider than the Whirlpool above, so fitting it between your washer and dry (or the wall) may be a tight fit. The extra width provides more stability and makes it harder to knock over if you have heavier bottles on top. Not to be confused with the rolling carts above, these laundry carts have built-in hampers especially for sorting laundry. Additionally, a couple of our recommended models have a rail for hanging clothes. This would be primarily used for holding hangers or hanging clothes you just pulled out of the dryer and don’t want them to wrinkle. Easily remove bags for washing. Large capacity hampers with durable chromed metal frame. Wall-saving bumpers to avoid damage. Removable and washable polyester bag. The attention to detail is what makes this cart our top choice. The rubber bumpers to protect your walls, heavy-duty wheels, and washable polyester bags make this cart a lasting addition to your home. The extendable hanging bar gives you plenty of extra storage for those clothes you want to keep wrinkle free. As far as carts and hampers go, the Whitmor Laundry Center has just about everything you need. The hanging bar has extensions on each side and a knob to prevent hangers from sliding off. The bags are removable and washable. The wheels are larger than any of the other hampers mentioned on this list and are heavy duty. Adjustable hanging rod rises from 39″ to 66″ high. Washable and Removable cotton-polyester canvas bags. 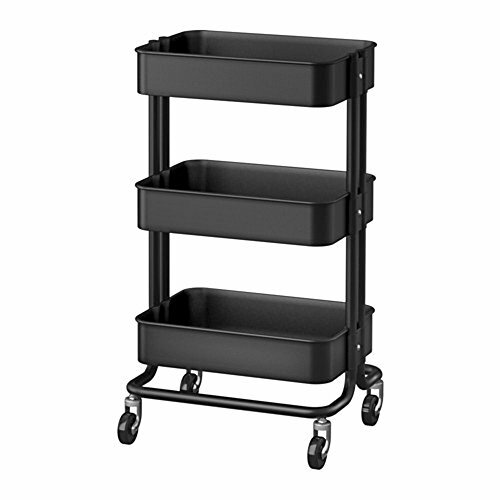 This Seville Classics cart is not quite as heavy-duty as the Whitmor above, but not everyone needs a heavy-duty cart! You get all of the same essential features, such as washable bags, clothes rack, and locking wheels. you likely won’t notice much difference. However, larger wheels generally roll easier. The hanger rod is adjustable from 39 to 66 inches, which may make storage of this cart easier. Any sort of customization is a bonus! If the clothes rack isn’t a necessity for you, then consider this simple laundry organizer. You get 3 heavy-duty bags and a durable chromed metal frame. It makes it easy to roll your laundry to the washer instead of trying to carry a pile of clothes while continuously dropping socks and shirts along the way. Most people don’t think about how easy it is to just toss your clean laundry into a cart instead of trying to carry a big wad of clothes to the room you fold in. Baskets work, but with a cart you can presort them. The bags are washable, so you can just throw them in with a laundry load every once in a while. DecoBros seems to be very responsive to customer issues and are willing to replace defective units, but overall the reviews for this cart are excellent. Chromed Metal Frame with durable wheels and bumpers. Great size for laundry chutes. 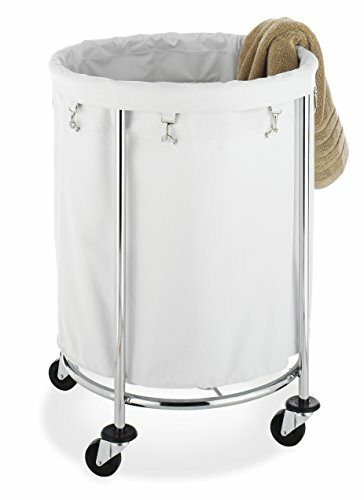 If you’re looking for something simpler than the multi-compartment carts we’ve shown above, then consider this simple laundry hamper from Whitmor. It’s super sturdy and surprisingly large. The bumpers are a nice feature that Whitmor tends to put on their products. 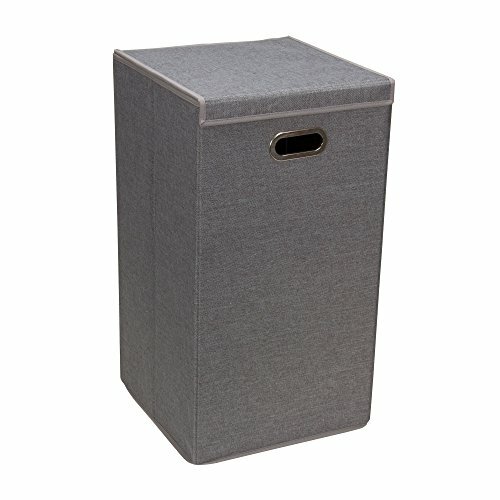 This is a simple round hamper that holds a surprising amount of laundry. The flexibility of a bag over a plastic bin lets you take better advantage of the volume. Folding and sorting laundry doesn’t have to be just grabbing clothes from a giant pile on your bed. You can sort loads as you pull them out of the dryer and use the top as a convenient place to fold or press your clothes. 3 Removable Bags with Breathable Mesh. 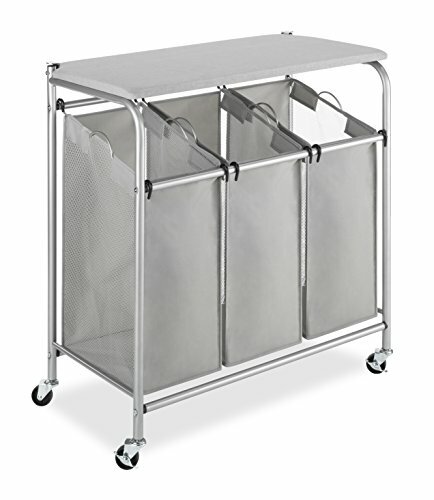 Whitmor is one of our favorite brands for Home & Kitchen products, and they don’t disappoint with this rolling laundry sorter and folding station. The locking wheels make it easy to keep in place while ironing. The mesh bags are a huge help in keeping clothes in contact with fresh air. The mesh bags mean dirty clothes will at least get some exposure to fresh air, which is better than the solid fabric bags. The three bags are enough space to sort clean or dirty laundry, just remember which is which. The shape of the top isn’t ideal for ironing, but it can be used as an ironing board. This is a nice alternative to the Whitmor above, and has canvas bags with mesh sides. Overall this cart is slightly smaller than the Whitmor, but has a more warm beige color and does the job. Both the Whitmor and Ollieroo bags are washable, but you won’t want to just toss them in the washing machine. Hand wash is best, or use a delicates mesh laundry bag to help protect the mesh. Reversible for right and left hinge doors. Metal striker plate and magnet keep the cabinet flush with your door. This cabinet is awesome. Our favorite storage products are the ones that convert normally useless space into something useful. This mirrored cabinet attaches to your door hinges and conceals 8 shelves of storage. It’s also reversible for right and left hinge doors. If you have a disappointing amount of storage space in your bathroom this cabinet is a great place to put small towels, rags, lotions, soap, make-up, and other supplies. You might even be able to use this in your kitchen if you have a laundry room nearby. This is a great way to store a ton of pantry items and optimize your space. The hinges can be positioned on the left or the right side of the cabinet so that it fits on any door that you want. The bottom and the middle shelf are fixed in place, but the rest of them can be adjusted to fit your storage needs. 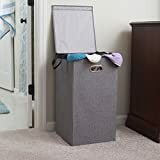 This is a great hamper to keep in a bathroom or bedroom to store your dirty laundry before it makes it to the laundry room. The removable bags mean you don’t have to cary a giant pile of laundry while dropping socks and shirts along the way. It’s also super affordable. 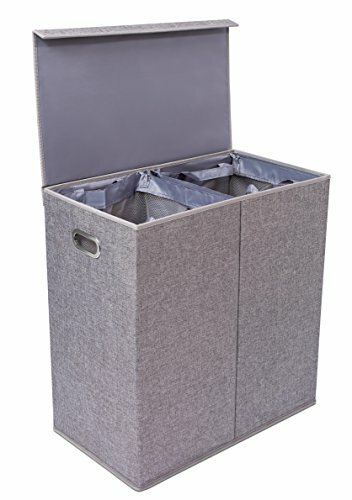 This hamper is neutral colored and has a flip lid with 2 hamper sections. It’s also easy to carry with the built-in handles. Keeping a laundry basket sitting out in your bedroom creates an eye sore, but this hamper isn’t ugly and doesn’t take away from a room. The laundry bags hold about 2 standard-sized loads of laundry each, so that’s 4 loads for the entire hamper. Similar to the BirdRock hamper above, this hamper is easy on the eyes but has a single compartment. There are a few different color options available: Black, Brown, Chevron, Grey. The bags hold approximately 2 standard-sized loads of laundry, which is true for the BirdRock as well. It is constructed from 2.5mm fiber board covered in polyester linen. Both the Household Essentials and BirdRock hampers are collapsible. That means you can fold these hampers down flat. The resulting dimensions will be the height and width of the hamper, as the long side of the hamper collapses. This section covers storage options that are lasting furniture pieces that will fit in your closet or bedroom. They can certainly be used for more than laundry, and the Prepac Elite cabinet selection goes far beyond the one example we’re showing here. You can buy multiple cabinet sizes that connect together to fit your space. 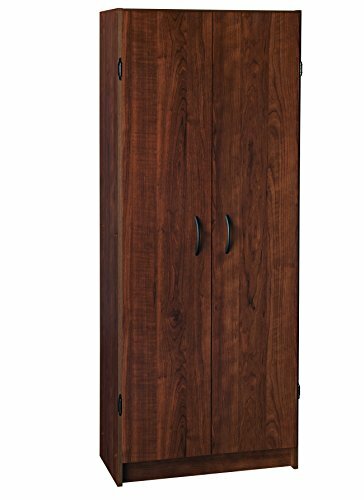 This 32″ tall cabinet is part of a larger set of cabinets that are designed to be used individually or fit together. These are a great option for adding storage to just about any room in your house. As with any engineered wood product, be sure to not use a high-torque device to assembly this cabinet. Additionally, nails are included to attach the back piece of the cabinet. If you have some small screws on hand use them along with the nails, since nails will work themselves loose over time. The doors of this cabinet are designed with six-way hinges so that you can choose whether you want the doors to open from the left or the right. The metal handles can also be adjusted to fit your needs, and the corners are all rounded for your safety. 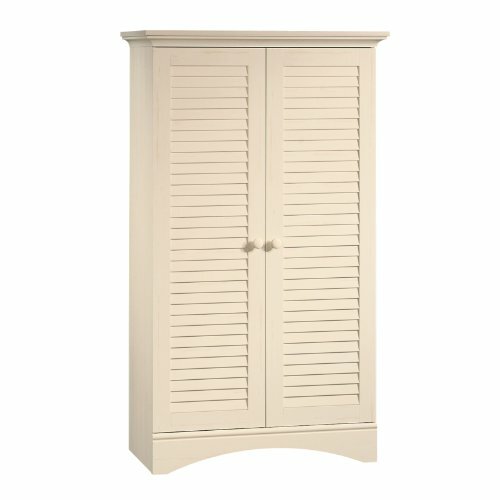 Another simple cabinet with two color options: Antinqued White or Antiqued Paint (Brown). Four adjustable shelves give you plenty of storage options. This model is nearly twice as large as the Prepac Elite above. These models will look more attractive in a bedroom or other area of your home, whereas the Prepac would fit in a closet or garage. The antiqued wood color option is more attractive than the plain white of the Prepac. Just keep in mind the dimensions when picking an cabinet. 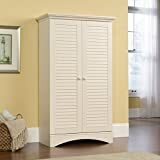 If you’re looking for something more affordable than the Sauder Harbor or Prepac, then this ClosetMaid cabinet is about the same size as the Sauder Harbor above. The color options include: Dark Espresso, Dark Cherry, White. 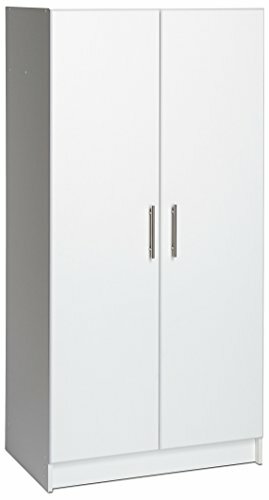 If you are looking for laundry room wall cabinets that have a narrow design for storing your clothes or other laundry essentials, then this 2 door cabinet is a great option for your home. It has about 4 inches less width than the other two models above. The slim design is perfect for narrow walkways because the cabinet will not take up a lot of space; making it perfect for a small, cramped laundry room.